[PDF] Physical Asset Management: With an Introduction to ISO55000 | Free eBooks Download - EBOOKEE! Posted on 2017-04-14, by luongquocchinh. 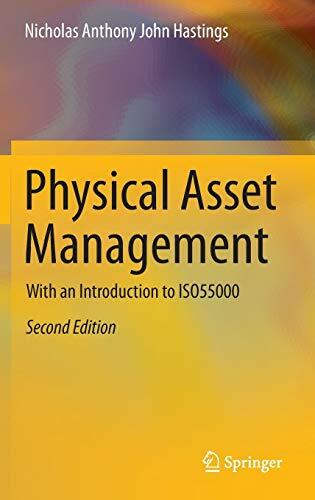 Description: Significantly extended from the first edition and published in response to the new international standard ISO55000, this book on physical asset management (2nd Ed.) presents a systematic approach to the management of physical assets from concept to disposal. It introduces the general principles of physical asset management and covers all stages of the asset management process, including initial business appraisal, identification of fixed asset needs, capability gap analysis, financial evaluation, logistic support analysis, life cycle costing, management of in-service assets, maintenance strategy, outsourcing, cost-benefit analysis, disposal and renewal. Physical asset management is the management of fixed assets such as equipment, plant, buildings and infrastructure. Features include: *Suitable for university courses and builds on first edition to provide further analytical material *Aligned with the international asset management standard ISO55000 *Provides a basis for the establishment of physical asset management as a professional discipline *Presents case studies, analytical techniques and numerical examples with solutions Written for practitioners and students in asset management, this textbook provides an essential foundation to the topic. It is suitable for an advanced undergraduate or postgraduate course in asset management, and also offers an ideal reference text for engineers and managers specializing in asset management, reliability, maintenance, logistics or systems engineering. No comments for "[PDF] Physical Asset Management: With an Introduction to ISO55000".